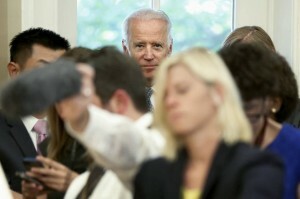 Mr. Biden is expected to announce his decision in September. Vice President Joe Biden is using part of his vacation in South Carolina this week to sound out friends and family about a presidential bid, as some Democrats press him to enter the race and give the party another option in the face of lingering controversies involving Hillary Clinton. From his vacation spot on Kiawah Island, Mr. Biden is giving the strongest signal yet that he is actively considering making a third run at the presidency. He is asking political allies for advice and gauging the strength of Mrs. Clinton’s campaign as he weighs his options, people familiar with the matter said. Mr. Biden is expected to announce his decision next month. Mrs. Clinton remains the front-runner for the party’s nomination in national polls, yet some party activists are growing anxious because of the expanding probes of her use of a private email server while secretary of state. A Biden candidacy would be a fresh sign that the Democratic Party has yet to fully coalesce behind Mrs. Clinton. In June, 75% of registered Democrats favored Mrs. Clinton in a Wall Street Journal/NBC News poll; last month, the figure was 59%. The surprising surge of primary rival Sen. Bernie Sanders of Vermont also suggests there could be an opening for Mr. Biden.